Last Friday’s blog post, Nuts, Peanuts and Health, reviewed how researchers have linked nut and peanut consumption with reduced mortality, yet they’ve found no such link for peanut butter. Somehow, I doubt that will affect its sales. Peanut butter has been around a long time. 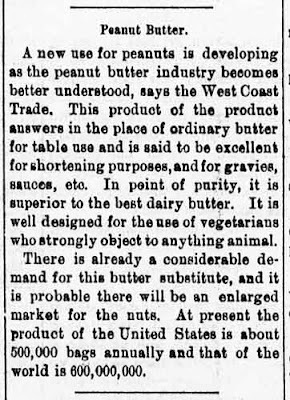 The first U.S. patent for peanut butter, No. US306727 A, 21 Oct 1884 (filed 3 Sep 1884), “Manufacture of Peanut-Candy,” was held by Marcellus Gilmore Edson of Montreal. His patent described a process of roasting and grinding peanuts to produce a paste, then adding sugar to manufacture sweetmeats and candy. Wichita, Kan. 11 Dec 1898. 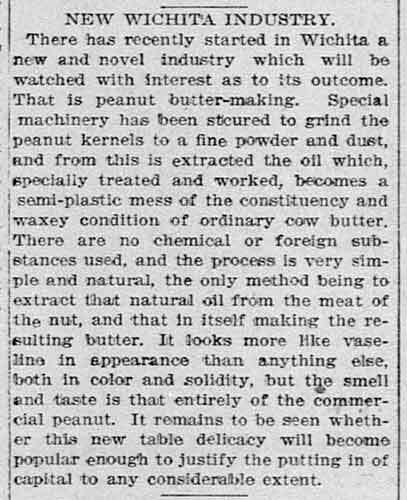 Though there are different accounts, it seems that an unidentified physician encouraged George Bayle, the owner of a St. Louis food products company, to mechanize the hand-grinder process and become the first to sell peanut butter as a snack food in 1894. Shortly thereafter, Dr. John Harvey Kellogg of Battle Creek, Mich., filed a patent, “Process of Preparing Nutmeal”--No. US580787 A, 13 Apr 1987 (filed 4 Nov 1885) that would produce an improved alimentary product as both a dry nutmeal and a pasty adhesive substance termed nut-butter. 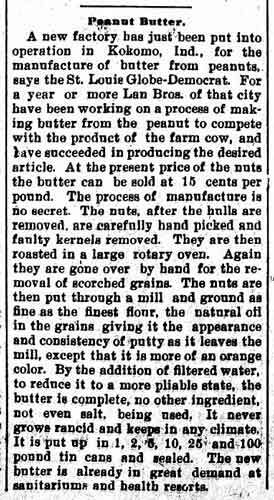 The peanuts were steamed rather than roasted before grinding, and the product was not very tasty. He and his brother turned their attention to breakfast cereals. Lansing, Minn., 19 Jul 1899. Dr. Ambrose W. Straub, of Philadelphia, is credited with facilitating the production of peanut butter with his “Mill for Grinding Peanuts for Butter,” Patent No. US721651 A, 24 Feb 1903 (filed 20 Feb 1901). His invention related to improvements in portable mills adapted for grinding peanuts, used in the manufacturing of peanut butter, and all kinds of hard, friable, tough, and moist substances. Some accounts link Straub with George Bayle, but I found no connection other than both being born in Philadelphia. 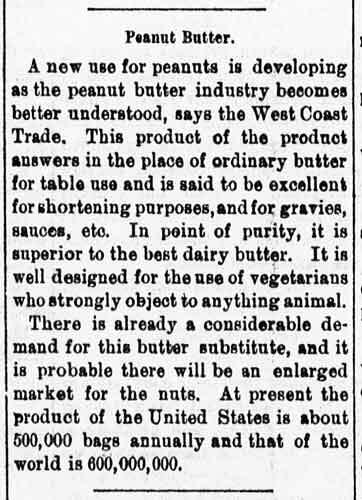 It’s likely, however, that it was Bayle Food Products that featured peanut butter at the 1904 St. Louis World Fair, after which major food companies introduced it nationally. 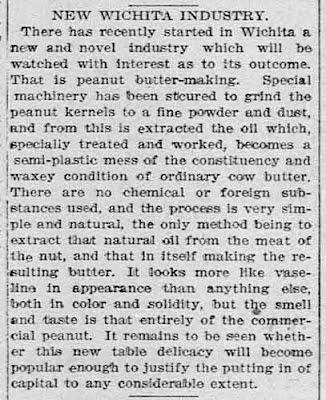 One of the most important advances in peanut butter industrialization was made by Joseph Rosefield in 1922. He developed the hydrogenation process which prevented peanut oil and solids from separating in the container, extending the shelf life. In 1928, Rosefield licensed his invention to the company that created Peter Pan peanut butter, and in 1932, he began producing his own peanut butter under the name Skippy. Akron, Oh., 28 Oct 1899. The only patent I found was filed years later by Marvin, Jerome and Joseph Rosefield, “Peanut Butter and Process of Manufacturing the Same” Patent No. US2397564 A, 2 Apr 1946 (filed 7 Oct 1942), which was an improved process especially efficacious for producing a highly stable, emulsified peanut butter having enriched nutritive value. -Over half of America’s peanut crop is used for peanut butter. -One 12-ounce jar of peanut butter requires about 540 peanuts. -Americans eat some 700 million pounds of peanut butter a year. -60% of American consumers chose creamy over crunchy peanut butter; women, children and people on the East Coast lean toward creamy, while men and people on the West Coast prefer crunchy. -Archibutyrophobia is the fear of getting peanut butter stuck to the roof of your mouth. And don’t forget that January 24 is National Peanut Butter Day. Yes, I know it’s also National Compliment Day and Global Belly Laugh Day. Anyway, if you miss it, March 1 is National Peanut Butter Lover’s Day, which is also National Horse Protection Day. 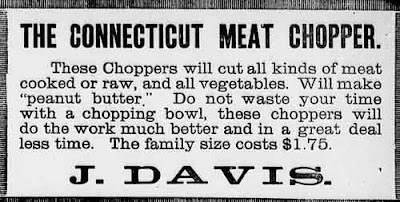 Advertisement from Perrysburg Journal, Perrysburg, Oh., 1 Nov 1901.